The Classic Buick Licensed Neon Clock is a throwback to the time pieces you might see hanging in an old greasy mechanic�s shop. Enjoy the look of this Authorized Buick Service Neon Clock that takes aficionados to another time, but adds a sleek, modern touch. 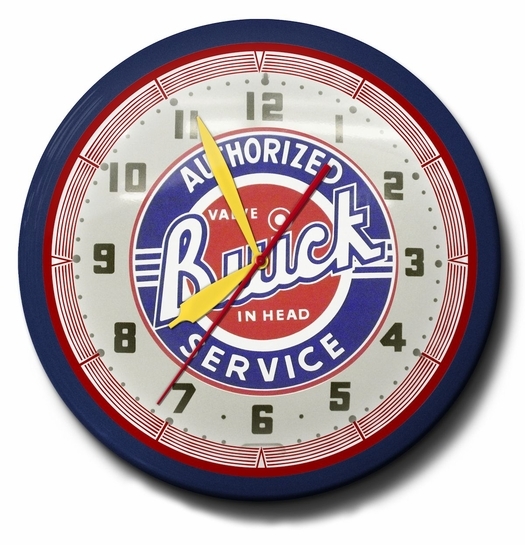 Hand crafted in the good old United States, the Classic Buick Licensed Neon Clock has a 20 inch face. The metal bezel is spun by hand to produce an eye catching powder coated, wrinkle black finish. The manufacturer carefully engineered the body utilizing premium materials. It was designed to project a neon glow of warm, appealing colors through a long performing half-inch tube. The neon will hold up over a decade � that�s more than 100,000 hours! Anyone familiar with the Buick line and its distinguished branding has to recognize the attention to detail on the beautiful, Authorized Buick Service Neon Clock. And anyone familiar with the manufacturer�s work wouldn�t be surprised. This manufacturer has been in the production of the highest quality neon clocks since 1989. Headquartered in Pittsburgh, they have a team of experienced craftsmen, machinists and graphic designers with a sincere and focused customer service leaning. Their clocks have been recognized for excellence both nationally and internationally. Clients as diverse as Hooter�s, Pizza Hut, Anheuser Busch and KFC have turned to this U.S. manufacturer for branding neon clocks that leave an impression on anyone that looks up to see the time. This Authorized Buick Service Neon Clock continues the manufacturer's reputation for brilliant 20 inch neon clocks. Whether an auto professional, enthusiast, or fan of the Buick, put this clock up on the wall and brighten your shop, garage, man cave, sports bar, diner, or dealership. The Classic Buick Licensed Neon Clock comes with a one year limited manufacturer�s warranty against defects in materials and workmanship. Ask a question about Authorized Buick Service Neon Clock: High Quality and Licensed. I bought this clock for the husband as a Christmas Gift for his newly built garage. I actually was nervous when I bought it since the Husband is so particular about everything and he's such a Car Freak. He loved it!! It was received in the time they promised and there were no defects. I would recommend buying this clock to anyone. It was well worth the money.